$5 Advance, $10 Door. Four time (2008, 2009, 2010, 2015) Nominee for the Blues Music Award (W.C. Handy Award) for "Pinetop Perkins Piano Player of the Year", selected by the Blues Foundation of Memphis, TN. 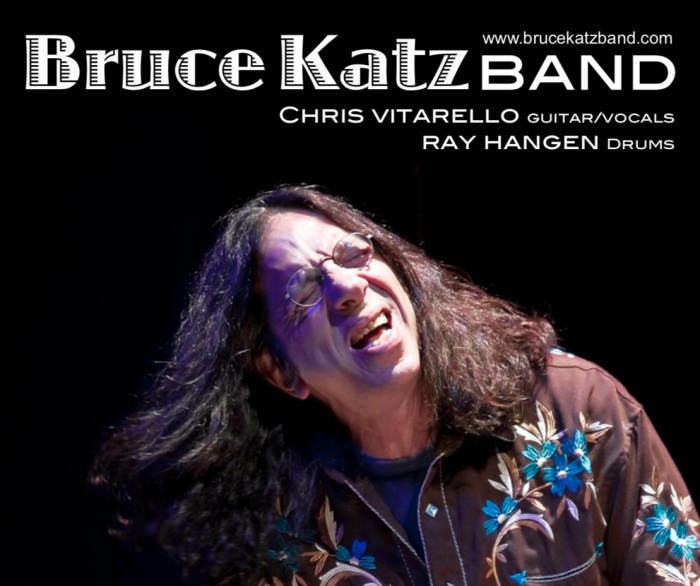 Bruce Katz is a four time (2008, 2009, 2010, 2015) Nominee for the Blues Music Award (W.C. Handy Award) for "Pinetop Perkins Piano Player of the Year", selected by the Blues Foundation of Memphis, TN. While Blues is a very important part of his music, Bruce's music has more angles and influences, occupying a unique space where blues, "soul-jazz", jam-band rock, and all aspects of Americana Music collide into a style of original music all his own. He is equally comfortable playing Hammond B-3 Organ and Piano. Besides leading the Bruce Katz Band, Bruce performs regularly with the Delbert McClinton Band, Jaimoe's Jasssz Band, John Hammond, and other artists as well. He was a member of the Gregg Allman Band from 2007-2013. Bruce was also an Associate Professor at the Berklee College of Music for fourteen years (1996-2010), teaching Harmony, Hammond organ labs, Private Instruction and Blues History. As a performer, Bruce has been an in-demand sideman as well as leading his own band. He has played and recorded with many of the leading names in blues and roots music, appearing on over 70 albums with artists such as Ronnie Earl, John Hammond, Delbert McClinton, Gregg Allman, Duke Robillard, Joe Louis Walker, Little Milton, Maria Muldaur, Jimmy Witherspoon, Paul Rishell, Mighty Sam McClain, Debbie Davies, David “Fathead” Newman and many others. Bruce has a lengthy background in classical piano. After hearing a Bessie Smith record when he was 10 years old, he started teaching himself blues and early jazz on the piano. He then heard boogie-woogie and swing music and continued his musical journey into more aspects of jazz and American roots music. Bruce attended Berklee College of Music in the mid-1970s, studying Composition and performance. For the next fifteen years, he performed with many of the leading musicians in New England, and played “on the road” for long stretches of time. After a particularly long stint of touring in the late '80s with Barrence Whitfield and the Savages, he decided to come off the road and enrolled at the New England Conservatory of Music in Boston where he earned a Master's degree in Jazz Performance and studied with Geri Allen, Paul Bley, Cecil McBee and George Russell. It was during this time that he conceived of and started writing music that became the Bruce Katz Band. In 1992, he met Ronnie Earl, who soon invited him to join his band, The Broadcasters. During his nearly five-year stint with Earl, Katz toured the world and performed on six albums, writing and co- writing many of the tunes, such as "The Colour of Love," "Ice Cream Man," and "Hippology." The album “Grateful Heart” (Bullseye) won the Downbeat Critics Poll for Best Blues Album of 1996. In 1992 as well, Katz debuted his first solo album, "Crescent Crawl", on the AudioQuest label. He released "Transformation" the following year. Just before the release of "Mississippi Moan" in 1997, his third solo album, Katz left the Broadcasters to concentrate on a solo career. At that point, the Bruce Katz Band began touring the U.S. and Europe, and has been his ongoing focus, in addition to his many other projects. In these years, Bruce played with Duke Robillard (2001-02), John Hammond (2005 – present), Gregg Allman (2007-13) and many other high profile roots, blues and rock performers, while continuing to tour and record with his own band. Bruce’s 2008 CD, “Live! At the Firefly" (Brown Dog Music/Vizztone), was received with critical acclaim. The CD rose to #11 on the National Living Blues Radio Chart, and received substantial play on XM/Sirius Satellite Radio His newest CD, “Homecoming (American Showplace Music, 2014) is receiving international acclaim and wide radio play, putting this album at or near the top of many radio charts, including the Living Blues Radio Chart for 4 months and The Roots Music Report for 18 weeks, rising to #3 on the Contemporary Blues Chart. Bruce has also been the subject of a feature stories and reviews in most of the leading blues and jazz publications throughtout the world. In addition to performing, Katz teaches piano, Hammond organ and theory privately at his studio in West Shokan, NY. He also conducts Master Classes in Hammond B3 and Blues History, which he has done at various schools and music festivals worldwide. Formerly from Boston, Bruce has been based in Woodstock, NY since 2005. The Bruce Katz Band maintains an active touring schedule throughout the U.S., Canada and Europe.